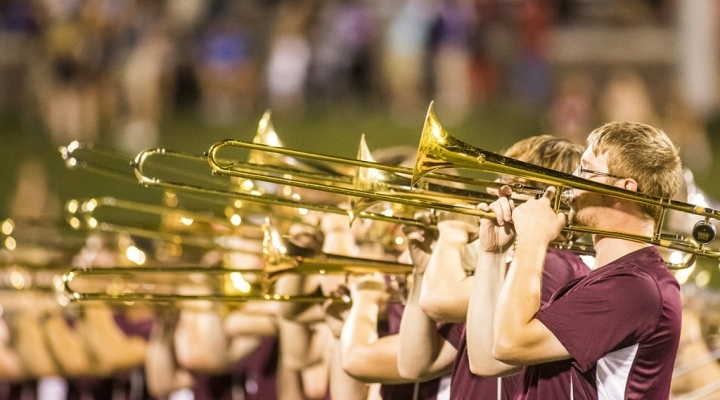 The Colonels Maroon Machine is the new, larger, and inclusive version of the EKU Pep Band. The band plays at home volleyball and basketball games and other events around campus. The group travels to OVC and/or March Madness basketball tournaments to perform on a regional and national stage. The Colonels’ Maroon Machine is a 0-1 credit hour class, which is required for participation. The course meets across semesters, from October through March, and physically meets from 7-9 PM on Monday and Thursday evenings. You must be available during this time slot, during typical game times (Thursdays and Saturdays) AND you must be available for the tournament trip (first week in March). Rubric: You are measured on all aspects of performance and how you hype. Instruments: Audition instruments will not be provided except a drum set. If you need help, please contact Dr. Wiggins. The Maroon Machine is open to all students enrolled in classes at EKU.